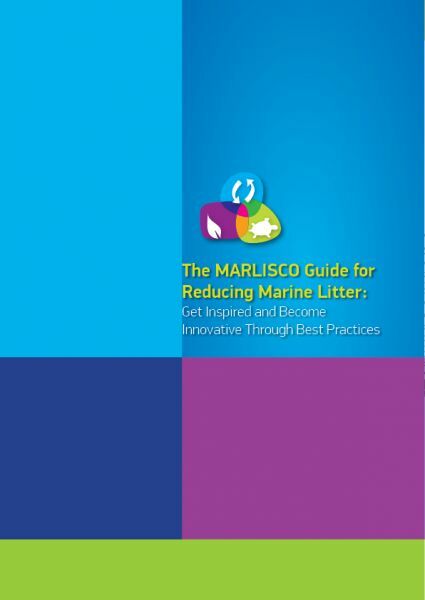 "The MARLISCO Guide for Reducing Marine Litter: Get Inspired and Become Innovative Through Best Practices" has been developed to provide an overview of the types of activities that different stakeholders could implement to reduce marine litter. The Guide does not aim to reinvent the wheel! It is based on a collection of over 70 best practices for the reduction of marine litter, recorded from across Europe and the world within MARLISCO. An analysis of these best practices showed that they can be clustered in 14 categories, each representing initiatives with specific, and often innovative, characteristics. Using these 14 best practice clusters the Guide presents the main actions that can be taken by key stakeholder groups to address the problem of marine litter. It provides an overview of the main types of practices, gives practical examples in the form of case studies and points the reader to further sources of information and details. Over the duration of the project the Guide will be translated in various languages, accessible through the links at the bottom of this page. Citation: Orthodoxou L. Demetra, LoizidouI.Xenia and LoizidesI. Michael, “The MARLISCO Guide for Reducing Marine Litter: Get Inspired and Become Innovative Through Best Practices”, ISOTECH LTD, 2014. Information on specific case studies presented within the Guide has been provided by various consortium members and/or stakeholders. For the relevant citations please refer to page 70 of the Guide. Special thanks to all MARLISCO partners who enriched the Guide with their ideas and suggestions, especially Eva Garnacho, Luigi Alcaro, Tom Doyle, Isabel Palma, Isabelle Poitou and Thomais Vlachogianni.